ETC Triple Chainset with 28/38/48T 170mm arms and Steel/Alloy rings with chainguard. Type of Bicycle City / MTB Bikes Material Alloy crank, Steel rings. Crank depth 2 mm. 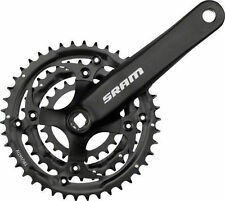 Crank length 170 mm. Transmission 22-32-42 Tooth. Colour Silver. ETC Chainset Alloy/Steel 28/38/48 Teeth 170mm Silver With Guard. 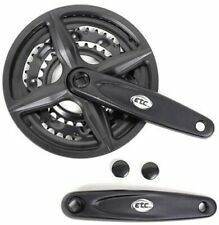 ETC Triple Chainset with 28/38/48T 170mm arms and Steel/Alloy rings with chainguard. 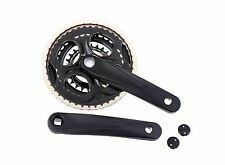 SR Suntour CW13 NEX-208 Chainset: 175mm Black. 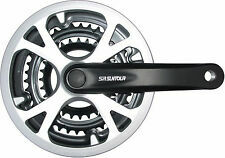 SR Suntour CCC870 Left Hand Crank: 170mm Black. Childrens 9 - 12. The pedals and threads are precession made on the crank and are fully tested before they leave the factory. ALLOY CRANK ARMS. 170 mm CRANK ARMS. BUILT-IN CHAIN GUARD.